My good friend Rebecca, a native Manhattanite, snapped the following photo someplace in the Big Apple. Frankly, I'm quite jealous that I didn't see this sign on my own, in my own city, because this is so blogworthy, & I feel a bit like a cheat posting someone else's photographic experience. That said, this is awesome. 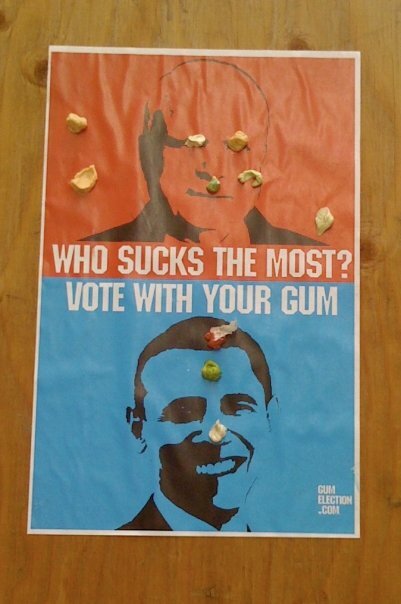 I love guerilla art. If I could find this sign online someplace, I'd post it in Dupont Circle myself! I also love that the McCain-haters plopped their gum right on his eyeballs. It's like the McCain supporters weren't even comfortable enough with their dislike to go all the way in defacing the Big O's likeness. Not going to lie- that sign is AWESOME! I'm so jealous that I haven't seen this sign in DC. Like you said, talk about blogworthy.